Oh Nooooo! I have a blue one also! 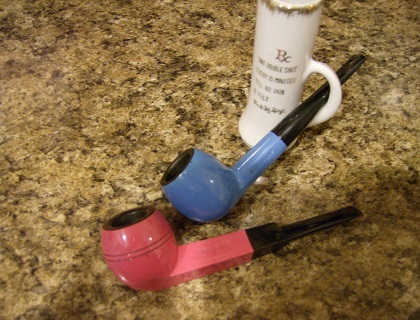 Yes, I have a blue "The Pipe" just like Simple Man admitted! Oh, and I have a pink bulldog, too! What was I thinking? Way back in my college days I collected several of them. Black, green, and white. I don't know what happened to them over the years but I still have the blue and pink ones! Anyone else have one of these, and still smoke them? I've got a few and all of them are horrible smokers except for my canadian... for some reason it does pretty good. I believe your blue one is a billiard though, isn't it? I really can't believe so many men bought these in the 60s and 70s. They really are not very good pipes and there were so many bargain pipes that actually were pretty good. Still, I'm glad to have them in my collection just for the memories of relatives I remember smoking them. The blue one is an apple. It's more round than a billiard. That's my take on it. I don't know why I bought the pink one except for it being a bulldog shape. Yes, it's all about the memories. BTW, I smoked the Crooner last night. It was just ok. It bit my throat a little. I might cut it with something else. A lot of something else! BTW, I smoked the Crooner last night. It was just ok. I might cut it with something else. A lot of something else! Yeah, I did not like Crooner at all. It seems harsh and the deertongue is a no go for me. If I were you I would probably toss it. I just really wanted another take on it to see if I was right. BTW, the C&D Small Batch is their Red Virginia. They just released 8000 tins before Christmas, the one you have is one of those. I have a tin of it too, I'm going to let mine get a few years on it before I smoke it. I may jar it though. I like Crooner on occasion, but to say it is a smooth smoke would be a horrible lie. If nothing else they're a great lead in for conversation. They are interesting. Never seen or heard of these pipes you speak. Yeah, I had a couple of uncles that I remember smoking them. They were the type that always had what was new. I looked up to them and now realize they were only in their 20s at the time. Yea, I think I had the pink one to go with my leisure suit! Oh heck, BloodWood probably hasn't heard or seen those either! I guess I'm just too old! Admittedly, I've visited only a handful of smoking lounges. Unfortunately, most of these pipers tend to put their best foot forward (read: they're sipping on an expensive pipe). Absolutely, no sightings of leisure suit pipes. For me, a guy who'd proudly wear sweats to every event if it weren't for my wife's stink-eye, I'd smoke those pipes with pride! My hat off to you gentlemen. I have a black billiard The Pipe. I smoke it semi regularly. Its not a bad smoker at all but it requires some real thought to get good smokes from these pipes. I've found that they smoke best when you use the finest shag cut you can find (I like D&R 3 Sails for this) and pack it as loose as you possibly can. My billiard is really big but the smoke should only take 10-15 minutes. If you pack it like a regular pipe it will burn hot and wet. I also have a number of Chinese clones of The Pipe. These are more realistic looking pipes. One is a free hand with pretty realistic wood grain finish. These also all smoke well but again I smoke them with super fine shag very loosely packed. I also only paid I believe about 3$ apiece for them.